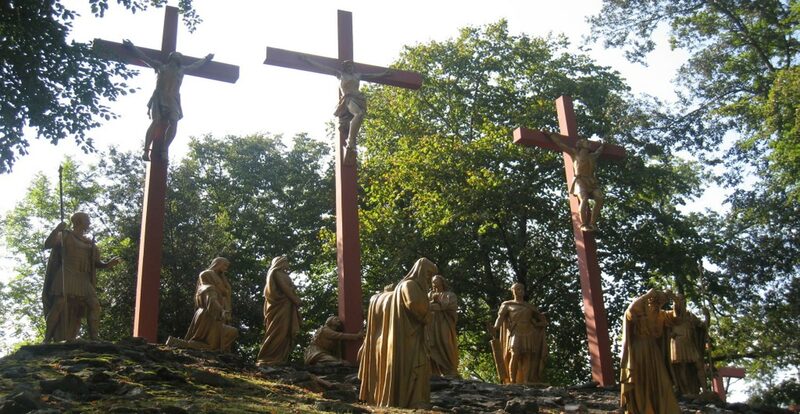 For some the contemplation of the Passion of Christ may occur only one day of the year…Good Friday. 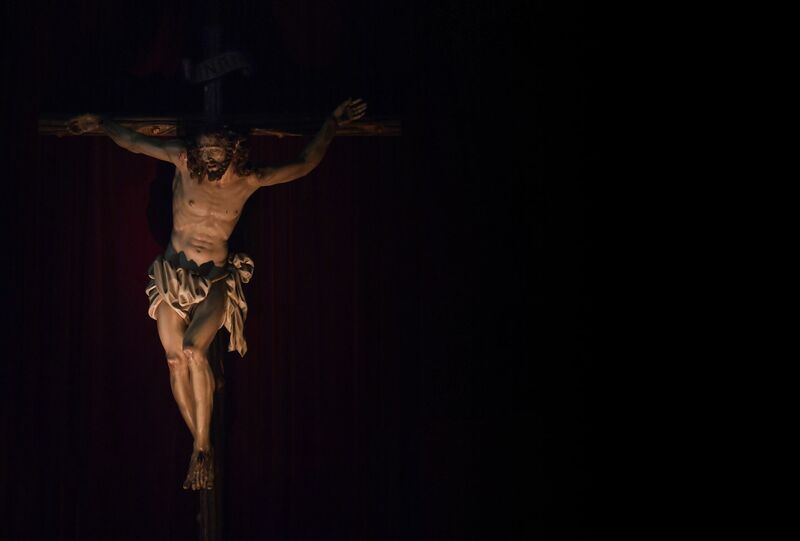 In the beginning of my spiritual journey with Jesus I was afraid to meditate on the Passion of Our LORD. I was afraid to see God suffering. I think I was even afraid to see the price of my sins…but Jesus kept urging me to honor Him by meditating on His Passion. So with some fear, I began to take a walk with Him to Calvary. I now do this every day at 3pm, the time He died for us. The Last Supper is completed. Jesus has given His apostles the Sacrament of the Eucharist. He has washed their feet and instructed them to serve and now Jesus and His chosen apostles enter the Mount of Olives singing a hymn. This will be the last time Jesus sings with His friends. Jesus descends into the dark Garden of Gethsemane. He has asked His apostles not to sleep but they have fallen asleep and alone Jesus sees all that He is to suffer. In anguish, I hear His loud cries to the Eternal Father. Jesus is truly God and He is truly Man and His humanity cries out for solace while His divinity accepts His most painful mission. I see an angel come from heaven to comfort Jesus telling Him how much we will all love Him and Jesus drenched in perspiration and blood accepts His Father’s will. The soldiers seize Jesus and He is so brutally tortured. The scourging alone could be enough to kill a man, but Jesus is so strong. Jesus is crowned with thorns and our sins are the thorns causing Jesus so much pain! We are all responsible for every drop of blood that He sheds and yet how many days and years go by without souls saying “I love You” to the Holy One who gave everything to spare His people from the price of Divine Justice. I see the Holy Mother of God, stoic and yet sharing spiritually in every pain Her Son endures. Oh what shame and continuous insults! 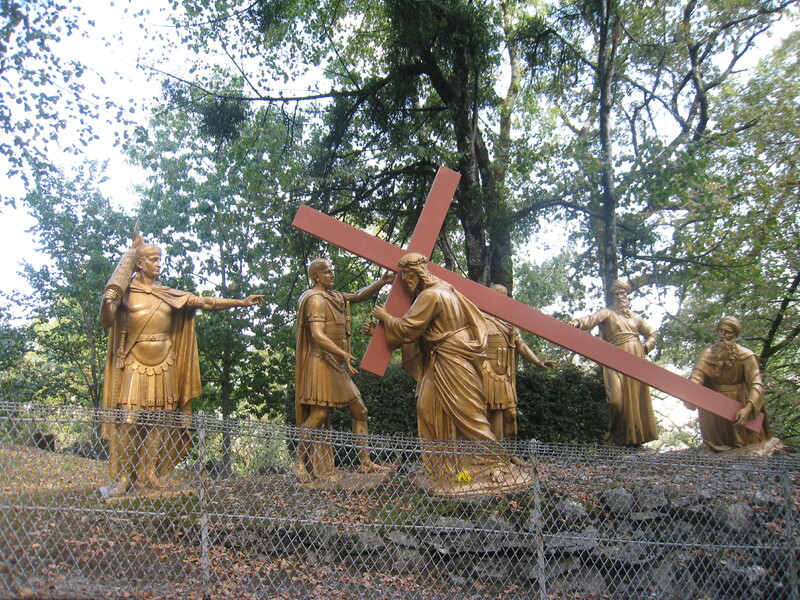 Jesus is pushed to the ground, mocked and forced to carry His own Cross up the Hill to Calvary. I see Him fall. I see His eyes so full of tears and pain yet full of resolve and hope…Jesus is saving the world! 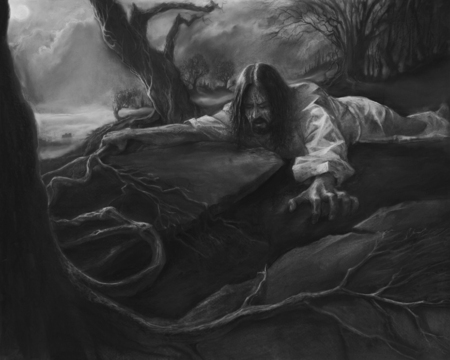 He is crushing the devil’s head as it was prophesied in Genesis 3:15. 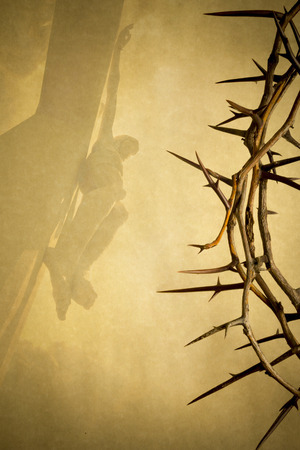 I hear Jesus cry out as He is crucified, “Father forgive them for they know not what they do.” Luke 23:34 I see Him hanging on the Cross in agony, struggling to breathe. Our Mother Mary stands in front of Him, strengthened by the grace of God. Her gaze never leaves Him…People in the background are still taunting Him, hurling insults….But we love Him!…And with a sword in our heart, we never take our eyes off Him! He gives us His Mother, honoring the Blessed Virgin in His last moments of life. “Behold your Mother.” John 19:26 The Virgin Mary’s communion with the Holy Spirit and with her Son Jesus is eternal and so too is ours if we choose, like Mary, to consent to God’s plan. 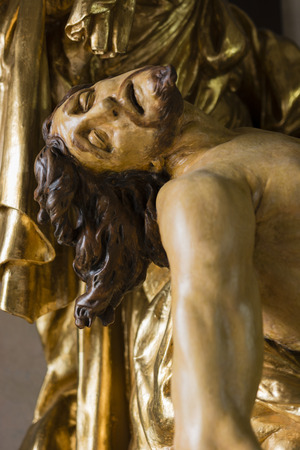 How do we bid farewell to the Holy One who is dying on the Cross? We don’t!…He promised He would not leave us orphans. He promised He would be with us in the Eucharist and that He would send His Spirit upon us so that He could live in us. He promised He was going to prepare a place for us and that He would be with us always until the end of time. This walk has changed my life. I do this every day at 3pm, the time Our Lord Jesus died for us and it has resulted in a relationship of intimacy that I cannot describe in words. The Passion of Our LORD Jesus Christ changed my life and it will change the world…one soul at a time…and as each soul enters truly and deeply into the suffering of Our God, we are transformed; we are renewed; we are sanctified. Temptation loses it’s grip. His wounds are upon our hearts. We become His Bride! Jesus cautioned His apostles to remember that the Spirit is willing but the flesh is weak. Are we resisting temptation or are we running towards it? Do we pursue relationships and experiences that feed the desires of our flesh or are we striving to do the will of God? Is our life focused on the pursuit of pleasure or the pursuit of God’s purpose? Are we actively striving to discover God’s plan for us? Do we trust Jesus? Have we surrendered our life to Him? Are we willing to embrace suffering in order to help someone in need? Holy Lord sometimes I feel overwhelmed by the challenges in my life. Help me to embrace Your Holy Will with courage and strength. I want to unite my sufferings with Yours and I ask You gentle Saviour to be with me to guide me and to help me to embrace Your Holy Will with faith, with hope and with love. Please let me be an instrument of Your peace and love. Not my will Lord, but thy will be done. I love You Jesus! Thank You for being willing to endure so much pain to open the gates of Heaven to me. Are we scourging Jesus today by the choices we make? Are we being selfish or selfless? Are we denying ourselves and carry our cross or are we being self-indulgent? How do we react in the face of injustice? Are we ready to pray for those that persecute people in the world today? Holy Lord I grieve my sins, please forgive me. I’m so sorry for the pain that I have caused You and others. Help me to be strong and to stand for those who are helpless and suffering. Help me to remember that for You all things are possible. Allow my words and my deeds and my prayers to console You for I am Yours. I love You Jesus! Are my words giving You glory Lord? Are my actions honouring You? Am I guilty of making fun of others with my jokes and my actions? Am I guilty of discrimination? Do I value some people more than others based on distinctions like wealth and status that have no importance in Your eyes, yet in the world breed division? Am I truly a positive Christian role model? Will they know that I am Christian by my love, by my patience, by my mercy? Do I need to pray more for people who are being made to feel like they are less important? Do I need to be more humble? Jesus please help me to see You in everyone. Help me not to discriminate and to value and respect all people regardless of gender, race, colour or religious beliefs. Let me treat all with the love and patience that I want to receive. Forgive me for the times I have not acted with compassion and love. I’m sorry Lord. I love You Jesus! Have I told You lately Lord that I love You? Have I told You that You are my inspiration and my consolation? Have I thanked You for suffering so much for me? Am I embracing my own cross with courage? Could I be doing more to help people who are struggling to carry their cross? Do I pray daily to try to ease the suffering in the world? Do I lament my own sufferings to much? Am I denying myself and striving to discover Your holy plan for my life or am I guilty of pursuing a path that is contrary to Your will? Holy Lord please help me to focus less on my needs and more on Your will for me. Help me to follow You, to learn from You and to trust in You. Help me to accept the challenges and burdens that are a part of my life. Help me to help others by being more compassionate and caring. I offer You all that I have and I thank You for dying for me and for all souls. You are my inspiration and my consolation. You are my heart’s desire! I believe in You, I adore You, I trust in You, I hope in You and I love You so much! I pray for those that do not believe, do not adore, do not trust, do not hope and do not love You. I want to believe that one day they will! How do I begin to say thank You to You Jesus for Your great love, for a sacrifice so enormous it’s difficult to contemplate? Am I showing those around You the mercy that You desire? Do I pray enough for those that have hurt me? Am I following Your commandments in the way that You desire? Am I guilty of lust? Am I being truthful with myself and with others? Have I dedicated my life for Your glory? Have I really surrendered to You Jesus? Am I spending enough quiet time with You, reflecting on Your will and learning Your Holy Word through the Scriptures? Am I doing enough for You Lord who are so worthy! Help me to honour You more Lord! Holy Lord I don’t know how to thank You for the pain and torture You endured to save me. I want to spend the rest of my life and all eternity telling You how much I love You and thanking You for dying for me! And I don't just want to tell You I love You, I want to show You; I want to prove it to You! You died for me, so I want to live for You! My life is in Your hands. Do with me whatever You choose. Use me for Your glory. Please fill me with Your grace so that I can fulfill whatever purpose You have for me. Please help me to remember always that vengeance belongs to You. Rid me of anger and fill me with hope. Jesus, I forgive all those that have hurt me and I know that You want to forgive all souls. I pray my Holy Lord that this page will help people to meditate on Your Passion, to love You more, to give You everything You deserve. My Saviour, I am Yours! For better, for worse, in sickness and in health, I want to love You and cherish You till death do us part and I enter into Your heavenly embrace forever. My soul longs for You and You alone! I love You Almighty God; You are my heart's desire Jesus!